The Healthy Hoff: Chickpea Magazine Has Arrived! 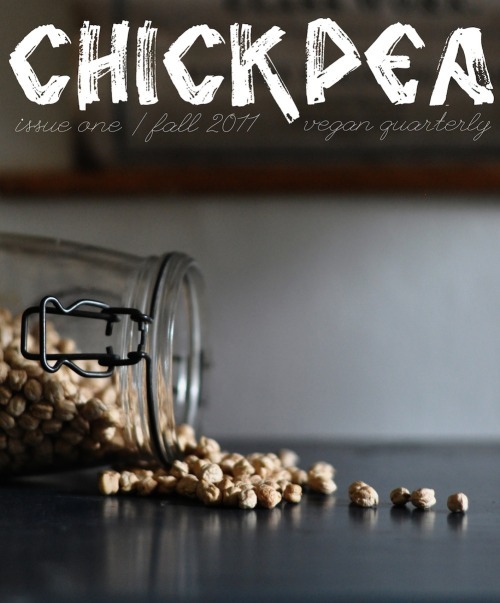 Chickpea Magazine has just launched it's first online and print addition! Full-out photographs, artistic in design and layout and NO advertising! It's also chock full of interesting vegan articles and recipes that the average Joe can actually make! While Bob and Cara are the brainchilds behind Chickpea, they collect submissions from the vegan community from around the world - from photos to articles to recipes and more in order to create it. Making this a truly unique and community-supported venture. You'll have to view their Fall 2011 edition here, because the paper version of the Fall edition is sold out! Pity, it really is exquisite. This vegan, lifestyle quarterly magazine will drop it's winter addition in mid-to-late December. If you want to get your hands on a print edition, visit the Cara's Etsy Shop! Check out the "Backers" page and you'll find The Healthy Hoff as one of the financial contributors (I do what I can)!